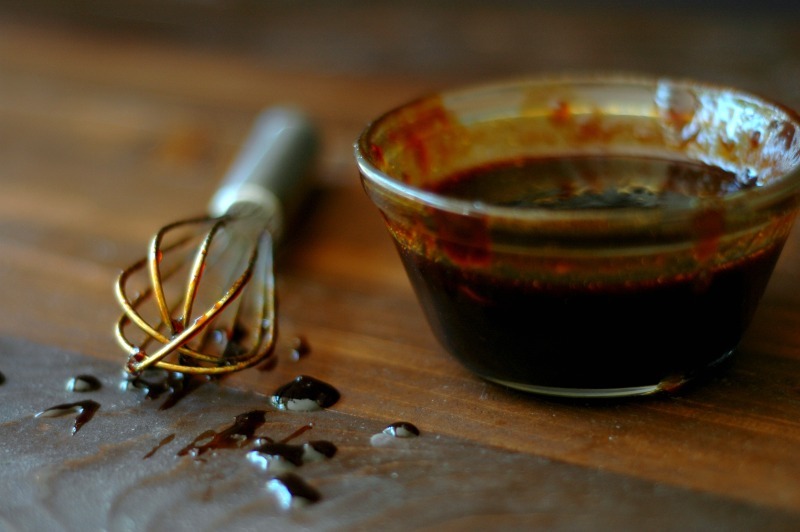 How To Make Balsamic Reduction Sauce :: Plus! A 30 Minute Sheet Pan Dinner! 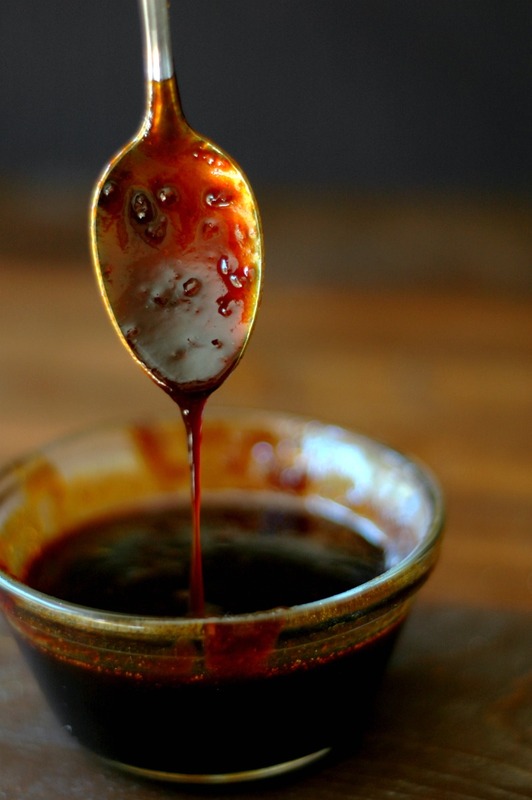 Sweet and sticky, this balsamic reduction sauce is the perfect, kid friendly compliment to any meal! Ladies and gentlemen, we made it to the beach last weekend! I’m not real sure what is going on with the cooler late spring temps around here, but we just couldn’t help it! Because I have 3 big time water bugs, I decided to go with the bathing suits despite the 60 degree weather, and 54 degree water temps (!! ), because inevitably they are like a moth to a flame when it comes to the big lake. I bundled them up in sweatshirts on top of their suits and off we went…my oldest and youngest flung their sweatshirts off the second their feet hit the sand…and yes my dear friends they did the polar plunge and totally swam in the icy water! Three extremely busy kiddos, means 3 extremely hungry kiddos! 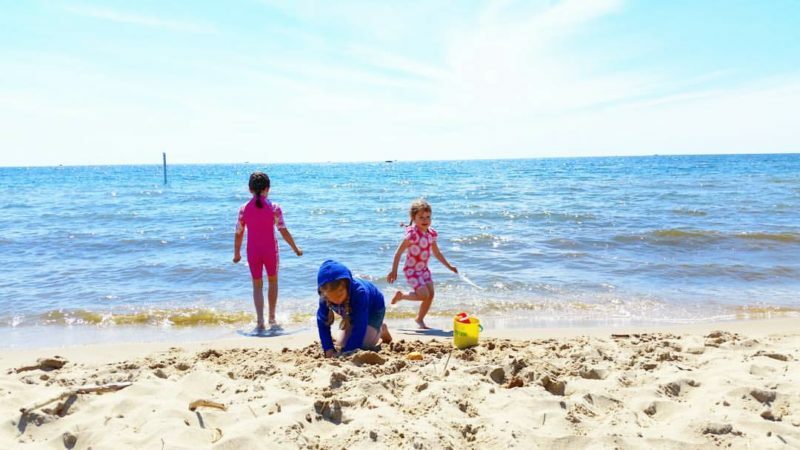 Summer time beach days sometimes call for light, snacky suppers, but more often than not, that doesn’t fly with my kids! They burn through everything so fast – they really need meals that count when they are so active. And I’ve got a super quick one for you today that will still give you enough time to spend the whole day at the beach if you want! I am not sure that balsamic reductions are the first sauce that comes to mind when it comes to kid friendly meals, but I’m telling you – my kids ask for this over ketchup any day of the week! Sweet and sticky, it makes any dinner meal that I drizzle it over completely disappear. 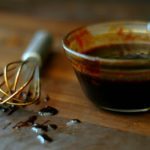 Balsamic reduction sauces are so versatile, tasting amazing over everything from chicken and fish, to steak or even salads and roasted veggies. It’s a great sauce to keep in your back pocket when you want to dress something up a little bit and need a little change up. So here’s the balsamic reduction sauce recipe! Use your sauce however you like! If you are stuck on a whole meal idea, keep scrolling for the sheet pan dinner idea to use your sauce with! 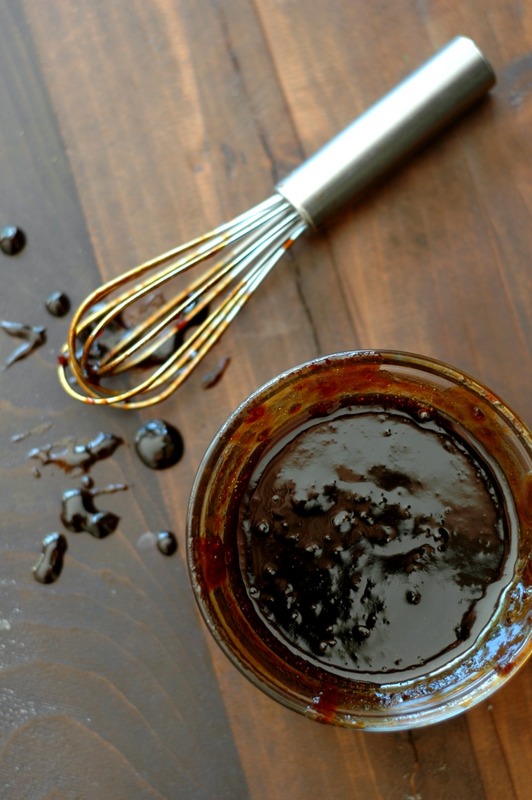 Sweet and sticky, this balsamic reduction sauce is the perfect, kid-friendly compliment to any meal! Put everything into a small sauce pan and bring to a low boil. Reduce the heat to medium/medium-low and simmer until the sauce has reduced by half, stirring occasionally along the way. This will take about 15 minutes. It will be viscous and sticky when finished. You can fix the rest of your meal or bake/roast a sheet pan meal while the balsamic sauce is simmering. So what about that “quick” meal you were talking about?! I promise I’m not going to leave you hanging. This sauce sounds amazing, but how do we make it work into a meal idea that is not only kid friendly, but do-able on a time crunch? Sheet pan dinners to the rescue! I’m all about these hands free cook methods, dear friends! Pile up that sheet pan with whatever veggies are in season and let the oven do the rest. While your veggies and meat are roasting, you can simmer your balsamic sauce up on the stovetop (recipe above!). Start to finish the sauce just takes 15ish minutes so it is perfect timing for a sheet pan meal! Toss all of the veggies with the avocado oil, sea salt, pepper, parsley, and dill on a large sheet pan. Spread them out evenly and roast for 10 minutes while you get the balsamic sauce going and prepare the salmon. While the veggies are roasting you can get your balsamic sauce simmering on the stove (see recipe above). You can also brush each salmon filet with avocado oil and sprinkle sea salt and pepper to your taste on both sides of each filet. After the veggies have roasted 10 minutes, take them out and stir the veggies around. Place the salmon fillets on top of the veggies and roast another 20 minutes until the veggies are bite tender and the salmon is cooked through to your liking. If you like your veggies softer, you can cook them longer than that first 10 minutes. The salmon will only need the last 20 minutes of cook time. 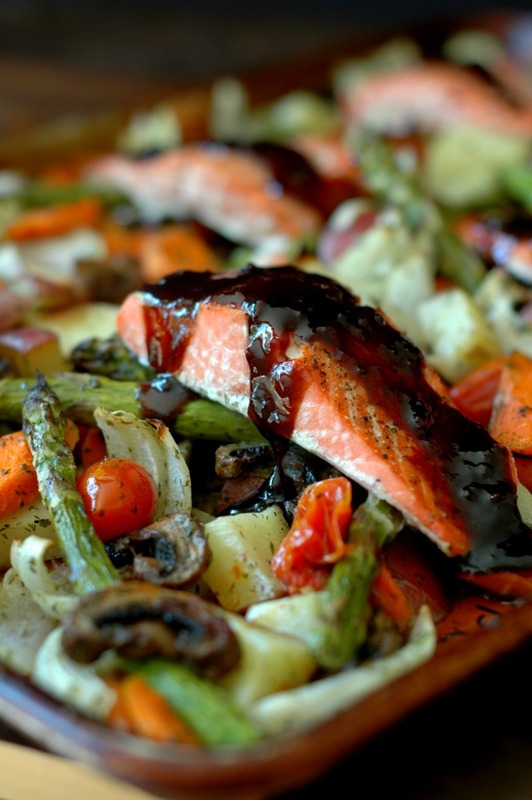 Spoon the balsamic reduction sauce over each salmon filet and drizzle over the veggies as well before serving. 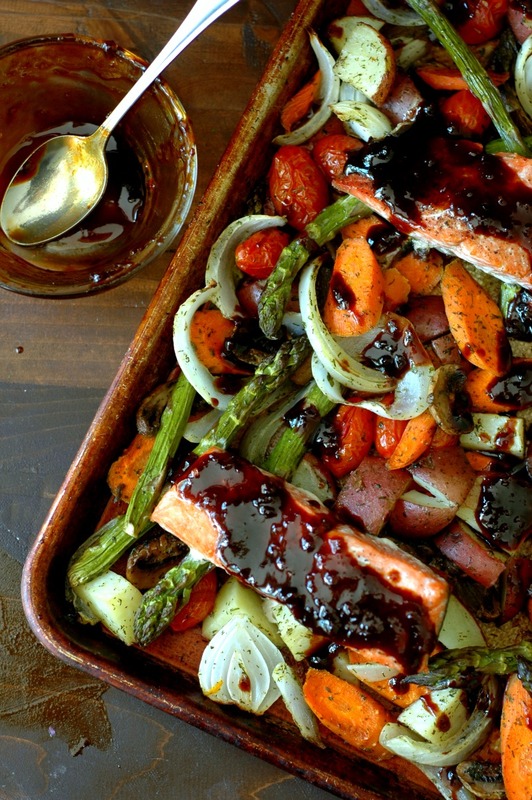 I love balsamic reductions and the ease of sheet pan meals. This looks so easy and delicious, I’m drooling as I type. This sounds awesome! I can’t wait to try this out on some avocados! Yum! I want to put this sauce on everything. And I can’t believe you jumped in the cold water! Haha I’m too big of a wuss for that..
There’s nothing better than a good sheet pan dinner + I love balsamic reduction so this is a major win all the way around! This is a total lifesaver when it comes to a meal that counts. Brilliant work as usual! And good on the kids – a polar plunge takes some guts!!! I love these kid-friendly meals you share! I’m sure my kids would gobble up anything with balsamic sauce since they love when I put balsamic vinegar on things! Will definitely be trying. Love the sound of this. Bet it’s all sweet and tangy – can’t wait to make it, and that salmon looks wonderful! I love balsamic sauce. It goes so well with everything. 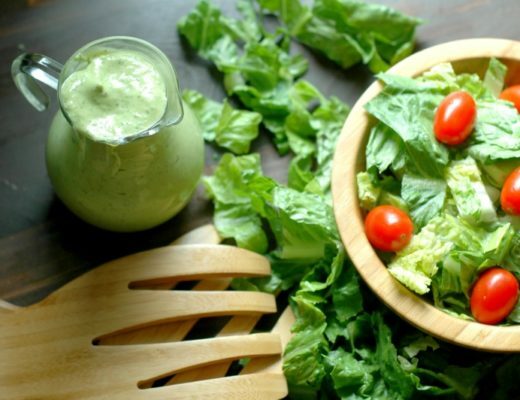 Thank you for sharing this lovely balsamic sauce recipe ! Balsamic reduction is EVERYTHING. Drizzled over those veggies, lawdy! So good. Just made this today and it turned out awesome, thank you so much for the recipe! Veggies were perfect, salmon was just right and the sauce rocked it! Hi John! Wonderful – so glad you could enjoy this meal! Thank you for coming back with your feedback! That sauce looks amazing, especially on that salmon. I cannot wait to make this! Love one pan sheet dinners, especially on busy days when the kids are hungry. 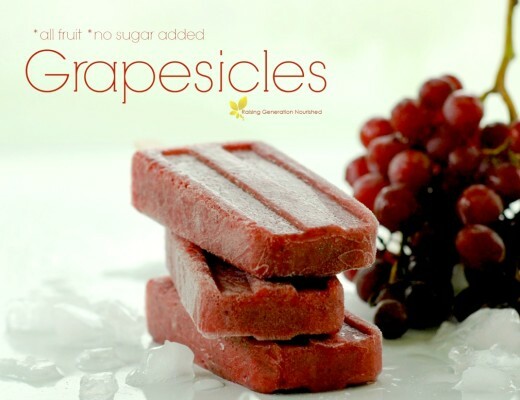 This is a superb resource with great recipes, this allows me to be more adventurous with my food. Thanks! I am loving all your sheet pan dinners! Keep ’em coming! Hi Shirlezee! I’m not sure – I have never had a problem making this recipe and we make this all the time. Did you make any ingredient swaps? This is a pretty typical balsamic reduction method, so I’m at a loss unless something was changed! I have never done this so I’m going to try this! I think it would taste amazing over roasted beets.